A large attendance, including relatives of Louis Brennan from the U.S., the Irish and British Ambassadors, representatives of the British and Irish Armies, Australian Navy, local councilors from Medway Council and members of Medway Library service, and a delegation of local historians from Castlebar and Mayor of Castlebar Noreen Heston and epresentatives of Castlebar Town Council, are expected to join in the unveiling ceremony in London on 11 March 2014. Louis Brennan was born on Main Street, Castlebar, Co. Mayo, on 28 January 1852, the tenth child Thomas Brennan, a hardware merchant in the town. Following the death of at least five of his older siblings as small children during the Irish Famine Years 1842- 1847, the Brennan family emigrated to start a new life in the gold rush boomtown of Melbourne, Australia. 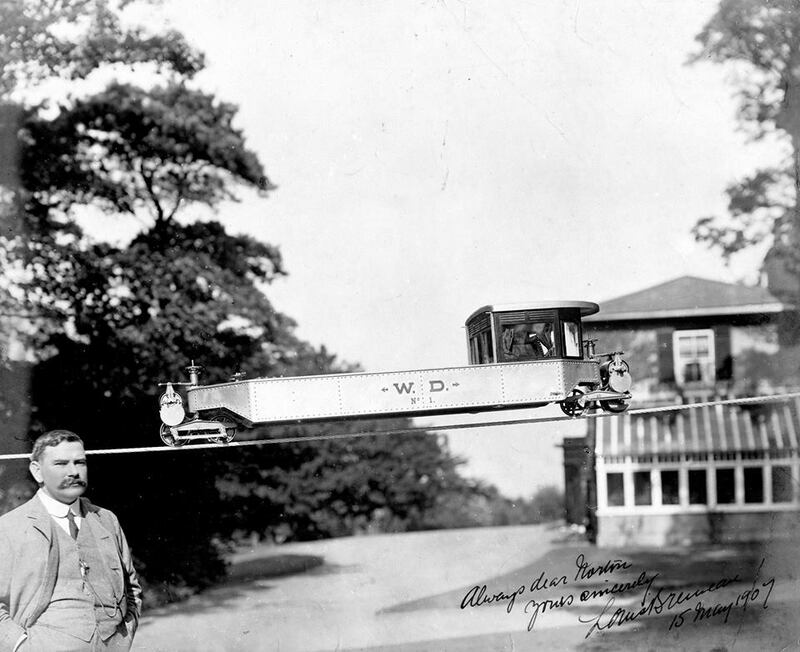 Louis Brennan started his working life as a watchmaker in Australia and went on to become an Irish-Australian mechanical engineer and inventor of Brennan's torpedo, an early prototype of the helicopter and the gyroscopic monorail.By the time of his death he had at least 38 items patented in London. While on holiday in Switzerland, Louis Brennan was knocked down by a car on 26th December 1931, and died as a result of the injuries received on 17th January 1932. He was buried in an unmarked grave in plot. No 2454, St. Mary's Cemetery, Kensal Green, London on 26th January 1932. A small committee of heritage enthusiasts in his native Castlebar banded together a few years ago to investigate the possibility of erecting a headstone to this famous Castlebar man. Now thanks to the sponsorship among members of The Irish Diaspora in England especially retired Manchester businessman Mr John Kennedy, C.B.E., K.St.G, D.L. of Manchester & K.M.C.O., Andy Rogers, John Basquill & Kieran Mc Cormack, London and the support of Castlebar Town Council Louis Brennan will now be given the recognition he richly deserves. A gravestone officially marking the final resting place of Louis Brennan will be unveiled by an Taoiseach Mr Enda Kenny T.D on Tuesday March 11th 2014. A memorial plaque will also be unveiled in the adjoining Oratory and a Memorial service conducted by Monsignor Canon Thomas Egan, (also a Castlebar native.) the Chief Administrator, St Mary's Cemetery will be held. A great crowd is expected in London for the unveiling of a headstone of Louis Brennan. These include a Captain from Australian Navy, Captain from Irish Army, two Captains from British Army, local councillors from Medway area, Reps from Gillingham Library and Medway Archives and Local Studies and a delegation of local historians from Castlebar and Mayor of Castlebar Noreen Heston & representatives of Castlebar Town Council. Relatives of Louis Brennan are to travel from the U.S. for the occasion. Both the Irish and British Ambassadors will also attend. There is international media interest in this event, which seems to have captured the imagination of people especially in Ireland, Britain, the U.S. and Australia. The Irish Post ,which is in wide circulation among Irish ex-patriots in U.K. , had a feature article in last week's issue. As a result requests to attend are coming in from Irish people all over Britain. It is gratifying to see such interest in this great man. His name had almost been forgotten among the Irish and British peoples, in spite of his worldwide recognition on the last century. Now thanks to the efforts of a small group of locals from Castlebar and the help and support from among the Irish Diaspora, his fame will last and a new generation will come to appreciate this famous Irish Australian genius.